KSRM Job Circular & Apply 2016 has been advertised. KSRM Means Kabir Steel Rolling Mill. Recently KSRM has given the Recruitment Circular 2016. Join with KSRM at Career Opportunity available now – www.ksrm.com.bd. KSRM is also child organization of Kabir Group. (KSRM) will recruit for various Posts circulated a Recruitment Advertise of Job Opportunity on 26 July 2016. Interested and eligible Bangladeshi Citizenship candidates are requested to apply after fulfilling the circularised conditions and instructions. Deadline for Submitting Application is 11 August 2016. ■ Job Description: Kabir Steel Rolling Mill (KSRM) has been published Job Circular 2016. Let’s check details of Jobs in the Circular. ■ How to Apply: Candidates have to Apply Online for “General Manager- Plant, General Manager -Technical, DGM -Electrical, DGM- Mechanical, DGM- Production, Sr. Manager/Manager- Quality Control, Engineer Electrical, Assistant Engineer -Electrical” through the email or send Resume to Mentioned address. Interested candidates may Apply through E-mail career@ksrm.com.bd or send the following address: DTo Human Resource Department, KSRM Corporate Office, Kabir Monzil, SK. Mujib Road, Agrabag Chittagong. Application will be submitted within office time on or before 11 August 2016. Kabir Steel Rolling Mill (KSRM) began his journey in 1984. KSRM is one of the largest rolling mills in Bangladesh. KSRM Steel Plant Ltd. is a Unit of Kabir Group of Industries, one of the largest groups of industries in the steel sector of Bangladesh-having 30 years of practical experience absolutely in steel manufacturing. KSRM has the ability to produce 4 lac metric tons product a year. KSRM is searching for few highly motivated, dynamic, energetic experienced and pro-active people to lead production at the factory in Chittagong. 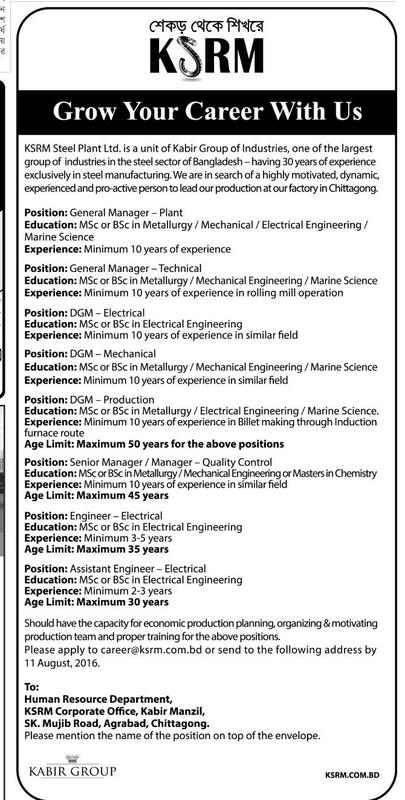 2 Responses to "KSRM Job Circular & Apply 2016"
Which side Diploma engineer can apply?